As September began Nike unveiled a striking new campaign marking the 30th anniversary of the 'Just do it' strapline. Ads used images of its chosen sports stars: simple, grainy, monochrome images with snappy copylines. 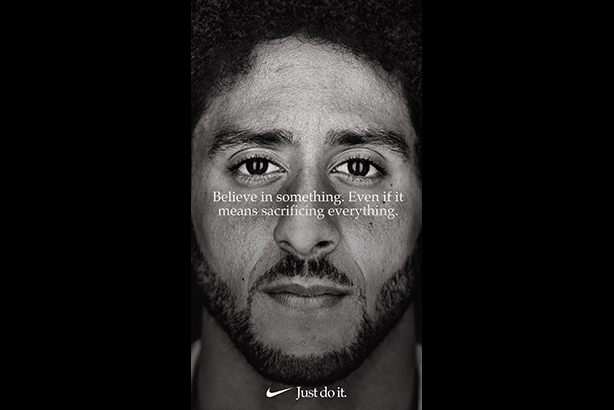 With this outdoor campaign and one short film (below), underpinned by a powerful earned media narrative, Nike succeeded in dominating the national and international conversation most of the month; partly because the timing was perfect. Indeed this was interpreted as Nike snubbing President Trump and US conservatives, who continue to slam the refusal of some footballers to stand for the national anthem. The campaign set a whole week’s narrative as, predictably, Trump tweeted his opposition and the furore rumbled on. Social media was alight with conservatives burning their Nike gear while young progressives (its core audience) heaped praise on the values-driven brand campaign. Then that weekend Serena Williams – another key figure in the campaign, pictured serving, with a strapline, ‘Girls from Compton don’t play tennis. They own it’ - certainly grabbed the headlines after her controversial outburst in US Open tennis final. When the campaign first broke, Nike’s share price slumped by three per cent as analysts perceived as sports manufacturer overstepping the mark. But at the time of writing the company’s shares were hitting record highs of nearly $85. And digital commerce research firm Edison Trends reported that Nike’s sales had actually grown 31% in the Sunday-to-Tuesday Labor Day period, improving on 2017’s comparative 17% increase. To Trump’s annoyance, Nike had come up with the most impactful, purpose-driven brand campaign this year, not only in New York, but anywhere.